A Covent Garden Gilflurt's Guide to Life: “Poor Wand’ring Wretches!" Francesca Blanch Serrat is my guest today to discuss the author, Charlotte Turner Smith. Francesca is a wonderful friend of the salon and I am honoured to welcome her! 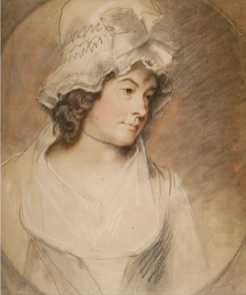 Charlotte Turner Smith (1749-1806) is known for her sentimental novels and for being the hand that brought back the sonnet. She managed to live solely by the pen, but her literary incursions where never limited to her –many- financial needs. 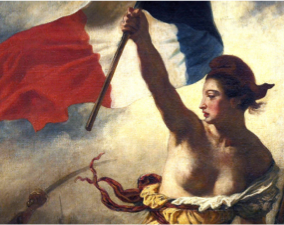 She had a remarkable literary involvement in the French Revolution, and always remained true to her political and moral beliefs. 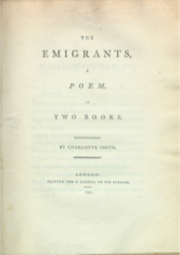 In this article, I will analyse her long poem The Emigrants (1793) to see how, through poetry, Smith managed to come to terms with her past and the emotional strains of forced exile. Smith was born into a family of good means, which provided her with a good education. She was very young when she married Benjamin Smith; a violent, abusive and reckless man. She wrote her first work, Elegiac Sonnets (1784) in prison, where she had moved with his husband when he was condemned because of his debts, and with the profits of its publication, she paid for his release. After that, the Smith family moved to France (1783-1785) to escape the creditors, and in these two years Smith became an exile. When they came back to England, she left her husband and devoted her talent as a writer to support her children, always struggling to make ends meet. The Emigrants was published in 1793. The poem consists of two books and explores the vicissitudes of the French émigrés in the south of England during the French Revolution. Smith, a supporter of the Revolution’s ideals, sides now with the members of the aristocracy and the clergy who have been forced to leave their land. She not only questions and criticises what will become the Reign of Terror but also feels a connection with these displaced characters. She clearly intertwines her own personal plight with these of the émigrés. In her analysis of Smith’s poetry Keane argues that “This [dominating trope of exile] can be attributed both to a “Romantic” preoccupation with a generalised condition of alienation and to the more particular impact of revolution and war on the discourse of national belonging.” (Keane 1991: 89). In other words, what theme could be more Romantic that this of the exiled? It merges politics, social unrest, the achievement of freedom and the emphasis on the individual and their feelings. Alienation produces in the subject a profound sense of displacement, and with that, an outburst of emotions one can easily relate to the state of the world in the eighteenth century. For Charlotte Smith, the construct by means of which she conveys her feelings is a group of individuals, none more important than the other. Her heroes are inclusive and seek comfort in each other. As Sodeman suggests: “Smith inscribes her sense of exclusion into her works through the exiles, emigrants, and wanderers that crowd her novels and poems” (Sodeman 2009: 138). These émigrés are not only somebody she can relate to but they also constitute “the other”, they are the party farthest from her political affiliations. Smith has taken it upon herself to feel pity on them: “poor wand’ring wretches! Whosoe’er ye are,/ That hopeless, houseless, friendless, travel wide” (I:296-297). It is not only her own empathy towards them what she expresses, however. She also looks for the reader’s empathy towards both the émigrés and, perhaps, herself. Quoting Sodeman once again: “The speaker’s experience and history is told partly through identification with the exiles” (Sodeman 2009: 139). She understands their trial because she, too, has looked at her own land from the opposite shore: “Ah! Who knows,/ from sad experience, more than I” (II:169-170), she claims. “I mourn your sorrows; for I too have known/ involuntary exile; and while yet/ England had charms for me, have felt how sad/ it is to look across the dim cold sea, / That melancholy rolls its fluent tides/ Between us and the dear regretted land/ We call our own” (I: 155-161). She acknowledges the differences between these –mostly members of the aristocracy and herself– but the class difference is obliterated because sorrow unites them all: “They, like me, /From fairer hopes and happier prospects driven,/ Shrink from the future, and regret the past” (II:15-16). In the closing lines of The Emigrants, Charlotte Smith leaves the émigrés apart to use once again her own voice and her own experience to make a plea to the whole of Humankind: “May lovely Freedom, in her genuine charms,/ Aided by stern but equal Justice, drive/ From the ensanguin’d earth the hell-born fiends of Pride, Oppression, Avarice, and Revenge.” (II: 431), and, if Freedom and Justice succeed in governing society, they will “fix/ the reign of Reason, Liberty and Peace!” (II: 445), which are the ending lines. Smith’s invocation of the superior forces of Justice and Freedom can be read as a personal appeal in relation to the system that not only failed to protect her but also imprisoned her. It can also be read as a message directed to the French, a call to yield the arms and be faithful to their principles. Taking the first interpretation as the most interesting one for the purposes of this paper, I suggest that for Smith the past cannot be healed, but there is the possibility to gain a better future, a just new life where Reason, Liberty and Peace rule. Smith’s work is a message to the world to stop injustice and suffering, a message taken from her own experience to Europe at large. As Wolfson suggests, Smith “infuses her final visionary hope with figures of female potency” (Wolfson 2000: 541). These figures are Freedom and Justice. I argue that Smith finds in female figures the capacity to return Europe to peace; as Wolfson puts it: “The Emigrants joins an evolving “female” poetry of condemning war as “patriarchal militarism” [however,] pacifism and militarism were not predictable or securely gendered discourses” (Wolfson 2000: 512). Therefore, Smith is appealing to two symbolic female forces (Freedom and Liberty) to fight seemingly symbolic male forces (Pride, Oppression, Avarice and Revenge) to obtain an ungendered result: Reason, Liberty and Peace. She resorts to these symbols at the end of The Emigrants, and they must entail, for her, the stability and primal link to Home, a bond impossible to break through exceptional or constant exile. The trope of motherhood and femininity in association with both Nature and symbols of empowerment was widely exploited in the literature of the time. Smith is reinterpreting the trope of the abstract muses in order to strengthen her sense of identity: “A wretched Woman, pale and breathless, flies!” (II: 258). And she continues as follows: [...] The desolate mourner; yet, in Death itself,/ True to maternal tenderness, she tries/ to save the unconscious infant from the storm/In which she perishes.” (II: 281). Her symbols are not allegorical figures; they are real women with real experiences, women Smith can relate to. In conclusion, Charlotte Smith deals with her past as an exile through the empathy that compels her to offer a voice to those exiles victims of The Terror, while being a fervent supporter of that same Revolution. Her poetry is inclusive, comforting, intimate and hopeful. She is a great example of the emerging Romantic movement, but, contrary to other Romantics such as self-centred Byron, she manages to turn her own experience into a social plea. Francesca Blanch Serrat is a recent graduate in English Studies specialised in English Literature and Culture and with a minor in Gender Studies from Universitat Autònoma de Barcelona (Catalonia). She also spent a life changing, tea charged academic year in Edinburgh University. She will be starting next year a MA in Advanced English Studies and wishes to become a PhD student. The article above is a piece from her degree dissertation: “But My Soul Wanders, I Demand It Back: Lord Byron and Charlotte Smith’s Poetry in Exile”. Her main focuses of interest are 18th century women writers and English and French Romanticism. She likes cats, Feminism, dead French revolutionaries, socks, and talking about Lord Byron with alarming familiarity. Smith, Charlotte Turner. The Emigrants: A Poem in Two Books. London: T. Cadell,1793. Keane, Angela. “Exiles and émigrés: the wanderings of Charlotte Smith.” In Women Writers and the English Nation in the 1790s: Romantic Belongings. Angela Keane, 81-107. Cambridge: Cambridge University Press, 2000. Sodeman, Melissa. “Charlotte Smith’s Literary Exile.” ELH, Vol. 76, No. 1 (Spring, 2009): 131-152. Wolfson, Susan J. “Charlotte Smith’s Emigrants: Forging Connections at the Borders of Female Tradition.” The Huntington Library Quarterly, Vol. 63, No. 4 (2000): 509-546. Written content of this post copyright © Francesca Blanch Serrat, 2015. Charlotte Smith had many children with her husband but not through her own desire. When he was imprisoned in the Fleet for debts it is said he gave money to a prostitute that was needed to feed the children. She hated lawyers. The case of her father in law's will took ten years and most of the money to resolve. She was bitter on behalf of her children. Her father in law meant to help the grandchildren-- which seems right and natural to me-- I would like to see that case. I think that would be fascinating!